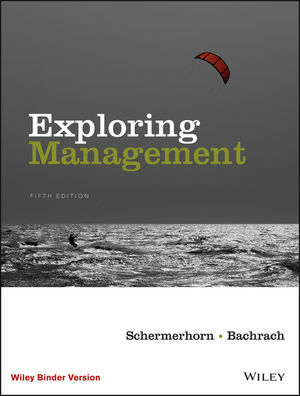 John R. Schermerhorn Jr. is the author of Exploring Management, Binder Ready Version, 5th Edition, published by Wiley. Daniel G. Bachrach is the author of Exploring Management, Binder Ready Version, 5th Edition, published by Wiley. • Author Addition: Daniel Bachrach, of the University of Alabama brings a fresh perspective and technology emphasis to the new edition. • WileyPLUS Learning Space: A new teaching and learning system developed by Wiley, WileyPLUS Learning Space embraces and leverages concepts of collaborative learning. Students can communicate with each other at the point of learning and the typical course management features integrate seamlessly. • Flip the Classroom: The flipping the classroom guide (and content in WPLS) enables instructors to easily use the text and WPLS in flipping their classroom for Principles of Management. • Chapter 2 Online: Chapter 2 on Management Learning is now available as an online chapter, which enhances accessibility by focusing students on the most important concepts. • Updates: We’ve updated Ethics Check, Facts to Consider, Hot Topics, Quick Cases and all other cases in the text. This will provide students with fresh examples for learning. •Author Lecture Videos: Created by new co-author Daniel Bachrach of the University of Alabama, these short video clips reinforce key concepts from each learning objective and are integrated into the e-text throughout WPLS. They aid in flipping the classroom in both a traditional or hybrid course. • Author Lecture Videos: Created by new co-author Daniel Bachrach of the University of Alabama, these short video clips reinforce key concepts from each learning objective and are integrated into the e-text throughout WPLS. They aid in flipping the classroom in both a traditional or hybrid course.  Student-Centered Design: Organized by study objectives and broken up into more manageable sections of material, the design of the text supports students reading textbooks and mastering concepts.  Integrated Study Guide: one-page checkpoints at the end of each section provide a quick review and opportunity for self-assessment.  Applied Pedagogy: features like skill builders, active learning activities and team projects give students frequent opportunities to apply management concepts.  Experiential Exercises: class activities offered throughout the text provide opportunities for discussion and debate.  Skill-Building Portfolio: This section includes self-assessments, class exercises and team projects, which correspond to every chapter in the text (with teaching notes in the Instructors Manual).  WileyPLUS Learning Space: WileyPLUS Learning Space provides instructors and students a dynamic learning environment in which to interact at the point of learning. Both students and instructors can utilize the system or bring in outside resources to aid in learning. Offering instructors a new methodology for engaging and assessing their students and/or flipping the classroom, this new system also allows students to take responsibility for their own learning.